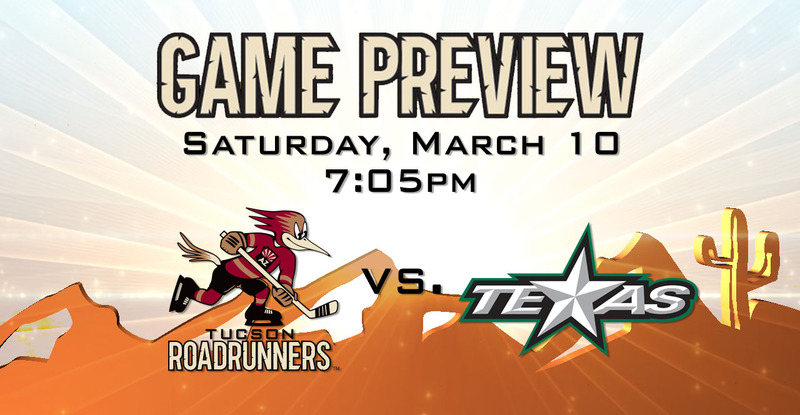 ANOTHER ROUND: Tonight marks the fourth and final meeting with the Stars this season, and Texas’ second of two scheduled visits to Tucson Arena. The Roadrunners are playing the final of a two-game home stand; the Stars are playing the final of a two-game road trip. 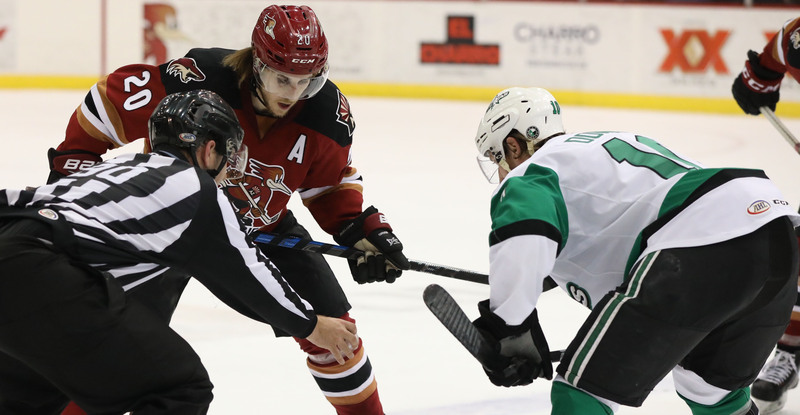 Both clubs are coming off of a meeting Friday night, which the Roadrunners won in overtime, 2-1. IT’S BEEN CLOSE: Seven of the Roadrunners’ last eight games have been decided by one goal; they’ve posted a 3-2-2-0 record during that span. In total, 26 of the team’s 53 games played thus far have been decided by a single goal – they have earned points in 20 of those games, putting together an impressive 15-6-4-1 record. SO EXTRA: Over the course of their last 18 games, the Roadrunners have extended to overtime or a shootout on nine occasions – winning seven times, including a pair of 2-1 overtime victories over the Texas Stars. Overall, the Roadrunners are 10-0-4-1 in 15 games played past regulation this season. PROJECTED LINEUP: The team held an optional morning skate at Tucson Arena ahead of tonight’s game. Per club policy, specifics regarding the team’s lineup will not be published until 5:00 PM this evening. CAMPER ON CUE: With a goal and an assist last night, Carter Camper now has a total of seven points (1G, 6A) in his first three games in a Roadrunners uniform. Camper (14G, 35A) is now tied with Dylan Strome (22G, 27A) in points scored this season with 49. Both players rank among the top 10 in AHL scoring. THE LAST TIME AROUND: In the teams’ previous meeting on Friday night at Tucson Arena, the Roadrunners defeated the Stars in overtime by a 2-1 score. Carter Camper netted Tucson’s lone goal in regulation, his first in a Roadrunners uniform. Mike Sislo buried the winner 2:10 into overtime to secure the victory, scoring his team-leading sixth game-winning goal of the year. Hunter Miska stopped 15 of the 16 shots he faced to earn his 16th win of the season. Miska is now a perfect 6-0 in overtimes. TWO, PLEASE: The Roadrunners have not won consecutive games on home ice since November 22 & 24, which was the tail-end of five-straight wins for the team at Tucson Arena (November 4-24) and eight-straight games (7-0-1-0) with points (October 27 – November 24). Since then, they are 7-10-1-0 on home ice. Can they earn back-to-back wins in their home building with a victory tonight? PLAYOFF PUSH: The Roadrunners enter the evening having the second-lowest magic number (24) in the Western Conference. The Stars, on the edge of the postseason cutoff in the Pacific Division, could fall out of playoff positioning with a regulation loss tonight. WE’RE DOING IT LIVE: You can catch tonight’s action on AHL Live. Roadrunners play-by-play broadcaster Tom Callahan will have the radio call on AM 1450 Fox Sports Tucson. Radio coverage begins at 6:50 PM.